It seems likely that it was this day during the week that Judas makes his decision to betray Jesus to the religious authorities. Was he just an evil man who wanted to destroy Jesus? Was he in it just for the money? Was he bitter about not having been selected for more leadership (even if he was the group treasurer)? Was he a zealot, hoping to push Jesus to begin a violent uprising to overthrow the occupying Roman forces? Was he simply trying to force Jesus’ hand, to make him finally act and bring about this kingdom of God of which he so often spoke? Jesus spoke about the divisive promise of his words when he taught about the mission he gave to his disciples and the fear and persecution that most likely would face. Considering the hardness of his words, it’s not just Judas who face such a temptingly tough question of faithfulness to the teaching. We too are faced with the conundrum of continuing, of how faithful to be to the teaching, of how to live out what we suspect, trust or have accepted as truth. 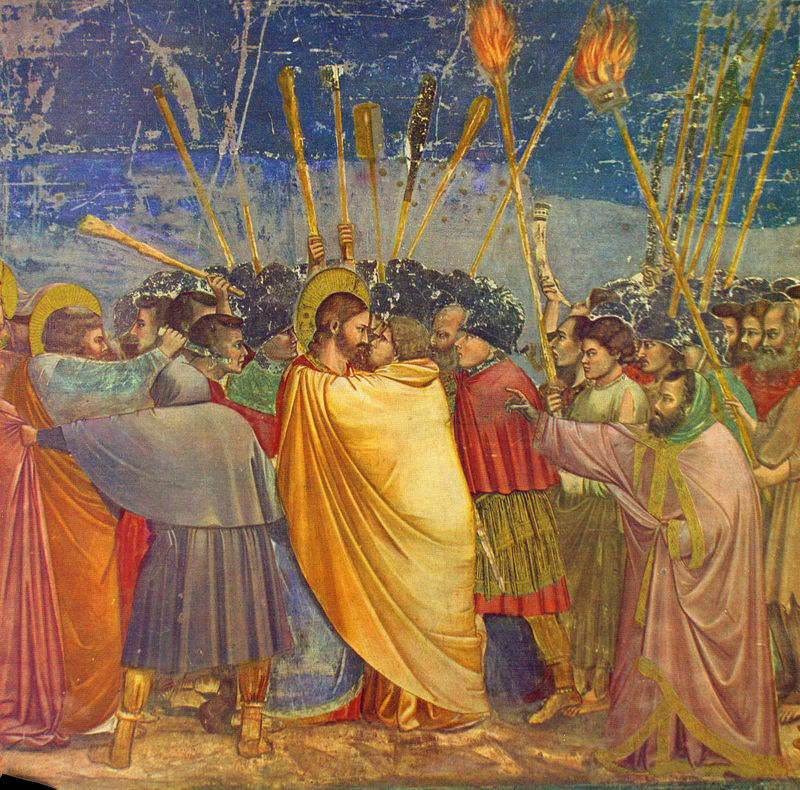 In Giotti’s famous fresco of the betrayal of Judas by a kiss inserted above, it’s composed to show Jesus as the center as the dividing line. Who and where do you struggle with what Jesus teaches? Where it might seem wrong? ; or even just to be too much? How has the teaching of Jesus been divisive in your life, relational circles, our world? How has it been unifying and/or life-giving? What are you carrying in this season as the burden that might blind or bind you, keeping you from trusting Jesus, of walking his Way with openness, teachability, and a desire to serve?